ENT Land Surveys, Inc. operated in Hillsborough, NC from 1983 to 2016. It accepted its last new project in December, 2015, and closed its office at 226 South Churton Street on May 1, 2016. ENT performed surveys primarily in Orange County, but also served Durham, Chatham, Alamance, Caswell, and Person. Survey markers placed since the late 1990’s were usually #5 rebar topped with orange or pink plastic “caps” with the company name and the phone number (no longer active) 919-732-6262. Virtually all of the surveys with value for conveyance purposes have been recorded at the appropriate Register of Deeds offices. Unfortunately, when the office closed, there was no opportunity to preserve over thirty years of paper records, so all were shredded. Some non-recorded individual surveys from 2000-2005 were scanned and copies may be available. Complete folders of surveys from 2006-2015 were scanned and more information is generally available. Original electronic computational information may also be accessible for earlier surveys on a hit-or-miss basis. 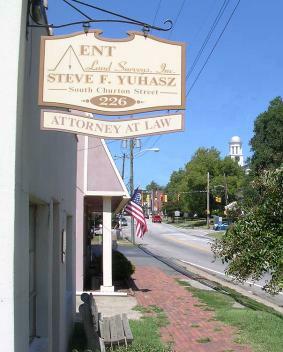 If you have questions or would like more information about a survey, please contact Steve Yuhasz at syuhasz@syuhasz.com. Include as much information as possible, including PIN, date of survey, owner at time of survey, address.